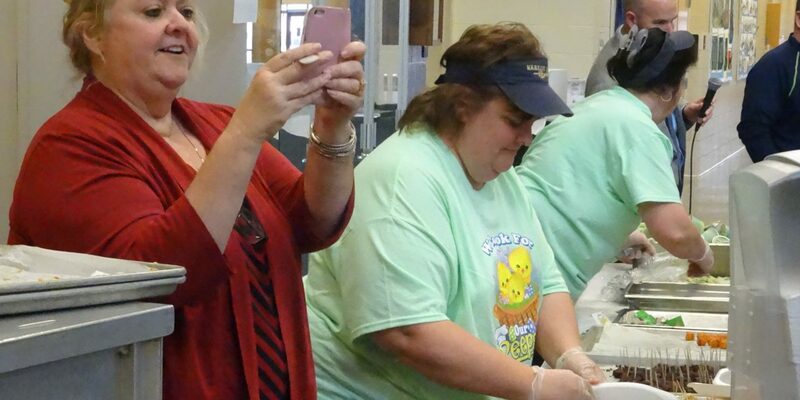 Putting together a menu for Brookfield Local School District is like putting together a puzzle, said Cafeteria Supervisor Donna Bailey. Bailey has to abide by specific government regulations, from calorie limits to requirements such as that students have access to at least 1.25 cups of red or orange vegetables – tomatoes, carrots – a week, she said. She also has to accommodate kids with special needs, such as those with food allergies and the small handful of vegans and vegetarians in the district, while still trying to offer food that kids want to eat. Bailey said she’s always asking students what they want to eat, but also tries to introduce them to things that they might not have had the opportunity to try before. But, when you start throwing around culinary buzz words like “whole grain” and “healthy,” it can turn kids off, Bailey said. 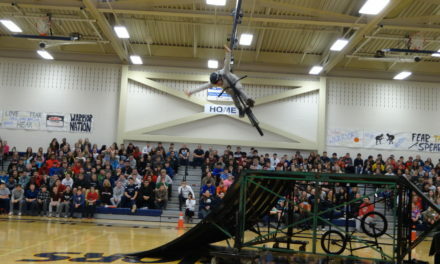 At a March 15 taste test at the high school, Bailey tried to convince students those thrusts are not mutually exclusive. “This is to show you things can be healthy and still taste good,” she told students as they passed through the taste-test line. Bailey asked the kids to sample several items and rate them: French bread pizza, a veggie burger made with black beans, sweet potato tots, turkey meat sticks, cheese sticks, Craisins, a whole-grain cookie and a lemon-lime ice dessert made of juice. “I think it’s good because it’s something different for us to try,” Bear Hebert, a junior, said of the taste test. Sophomore Samantha Craig said she likes the regular menu, but appreciated having more options. “I feel it would be wonderful to have varieties in your diet,” she said, noting she sampled the pizza and cookie. John Hiner serves himself sweet potato tots while Leanne Mosora offers him cheese sticks. 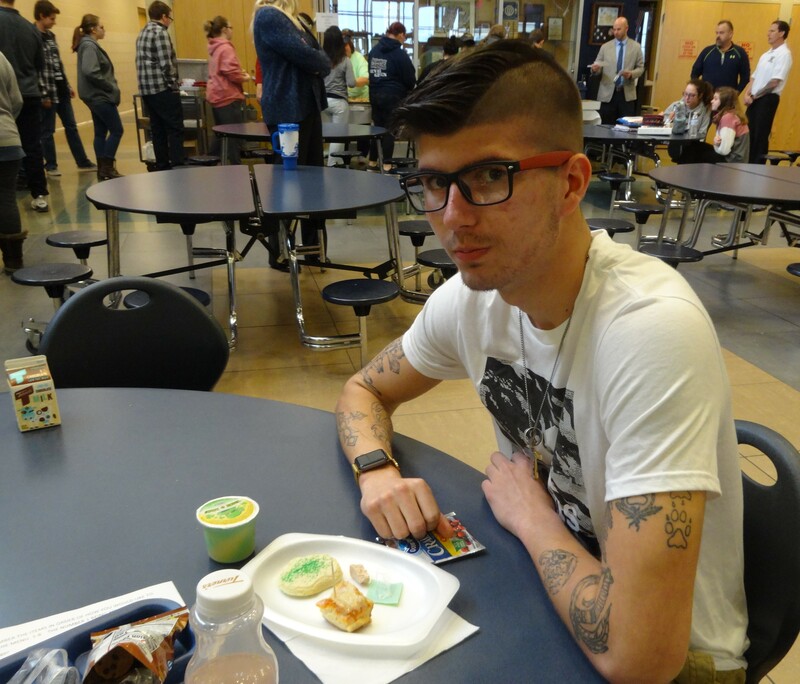 Alexander Parrish, a junior who liked the turkey and pizza, spoke along the same lines. “I think something different in our diet would keep us from being stale in our food,” Alexander said. Not all of the options at the taste test were new. Bailey said she had had the spicy veggie burgers available for about a month, but many students hadn’t tried them. They couldn’t get over how they look: dark brown and shredded, she said. Anything with sweet potatoes is a hard sell, too, she said. She’s pushing them because they give her another orange vegetable option. 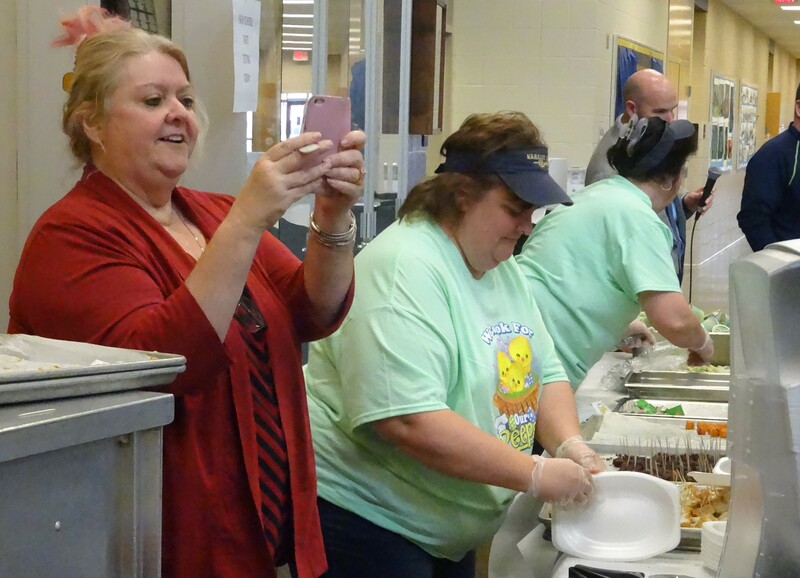 Brookfield Cafeteria Supervisor Donna Bailey takes pictures of students falling in line for a taste test of potential new lunch offerings. 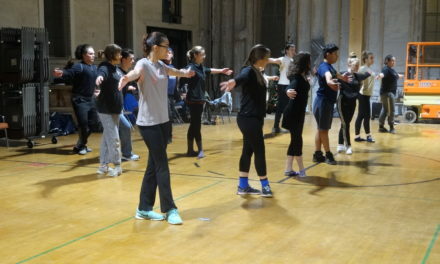 Also shown are Kim Osberg and Leanne Mosora. Brookfield receives a little extra money from the federal government for its school food program because of its high rate of students who qualify for free or reduced-price lunches. The federal benchmark is 40 percent and the current rates are 64 percent at the elementary school out of 365 students; 67 percent at the middle school out of 349 students; and 43 percent at the high school out of 309 students. Average school lunch participation rates are 51 percent at the elementary, 54 percent at the middle school and 57 percent at the high school. About a quarter of all students eat breakfast at school, most of them for free or at a reduced price. 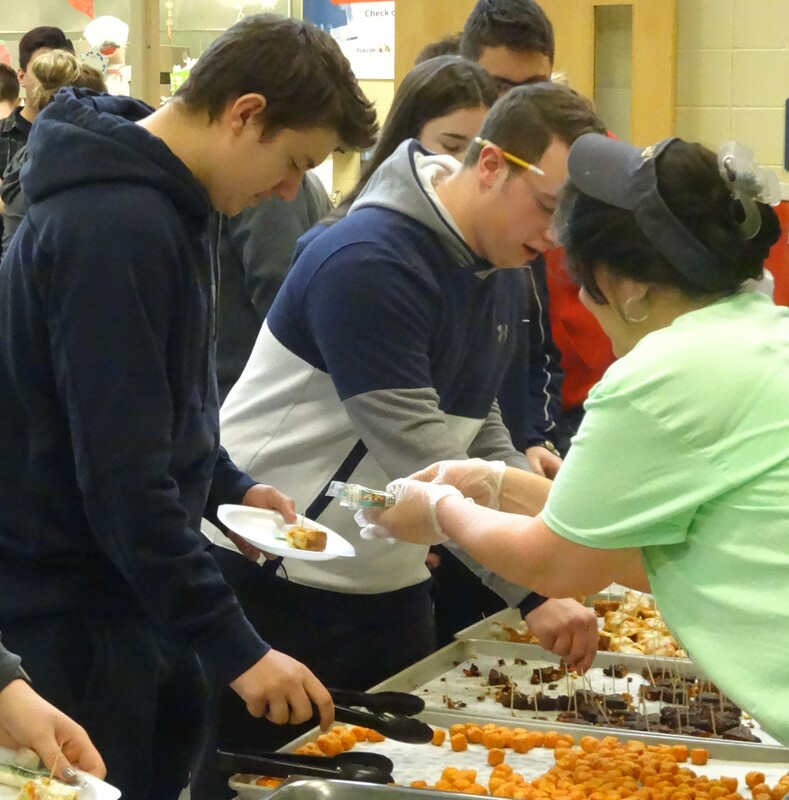 Sometimes, a small change that has nothing to do with the food itself can jump start participation, such as Superintendent Velina Jo Taylor allowing students to grab a breakfast and eat it in their classrooms. “That has increased our participation in breakfast,” Bailey said. Is a school levy request on the horizon?